Into your crock pot place 1 cup of baby carrots, the contents of a 15 oz can of tomato sauce, and 2 cups of kitchen basics stock (I used veg flavor, but use whatever you have on hand). Stir in 1 tsp garlic powder, 1/2 tsp coriander, 1/2 tsp thyme, 1/2 tsp marjoram, and 1/2 tsp salt, and grind some pepper over the top. Give it a little stir. Lastly, add 1 lb of stew beef chunks (mine were partially frozen). Cook for 8 hours on low, or 4 hours on high. Shut off the crock pot, stir in a Tbsp of tomato paste and let it sit while you prepare some rice (we like brown, but use whatever you’ve got). To serve, layer into each bowl a handful of frozen peas, a paddleful of rice, and a ladelful of stew (the residual heat will cook the peas). Bask in rave reviews from your 7-year-old and 4-year-old. Ew… Peas… But, yum, stew. I now declare that I desire a crock pot for giftmas! Love, love, love beef stew. 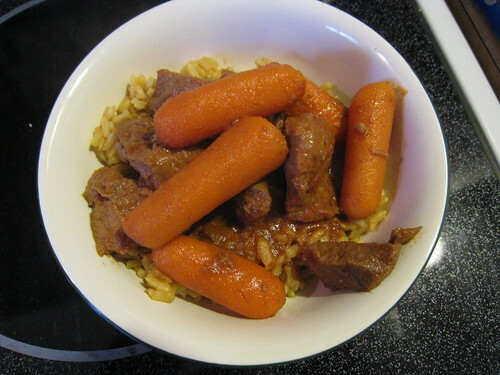 I have a recipe, that can be done in the crock pot or an oven, using v-8 as the liquid base, and tapioca for thickening. Its oddly amazing.